Waveney River Centre01502 677343work01502 677566fax Holiday Park (CP)Waveney River Centre features some of the most stunning views to be found anywhere in the Broads National Park, giving you the chance to relax and watch the abundant wildlife as well as the comings and goings of boaters. Discover the Broads by canoe or day cruiser, walk to Oulton Broad via our pedestrian ferry, or just soak up the glorious views across the marshes from the comfort of our riverside Touring Park. 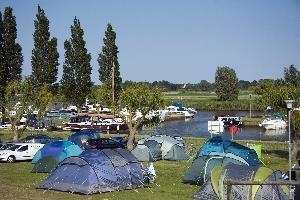 Our touring & camping area is small and family-oriented, with room for 14 touring caravans and up to 35 tents. It occupies an idyllic south-facing location overlooking the marina and river, with leisure centre, showers, toilets & wash up area all immediately adjacent. We've even built our own Escape Pod glamping pods - built by our boat builders here on the Park. Our individual wet rooms feature shower, basin, WC, hairdryer and under floor heating. Now you've no reason to stay tucked up in your sleeping bag! Enjoy a swim in our indoor heated pool, or let the kids use up their energy on the adventure tower before visiting the new wildflower garden, where they can spot insects and bugs and hide out in the pollarded willow huts. Our family friendly pub was completely refurbished for 2014 and serves a delicious menu of locally sourced, home cooked food. Our shop and off licence stocks everything you need including clothing, fishing and camping gear, gifts and a range of local produce. Waveney River Centre features some of the most stunning views to be found anywhere in the Broads National Park, giving you the chance to relax and watch the abundant wildlife as well as the comings and goings of boaters. Follow the A143 to Haddiscoe and turn at the village hall into Wiggs Road, signposted Waveney River Centre (left when travelling from the east and right when travelling from the west). Continue to follow the brown signs, turning left into Burgh Road after 2 miles and proceed for another 2.5 miles until you arrive at the Centre. If your Tom Tom tells you to go a different way, please ignore it and follow the brown signs instead. The route usually suggested by satellite navigation systems features a number of blind bends and is completely unsuitable for holiday traffic. The signposted route does have some passing bays.